Peugeot's Project Co-ordinator Jacky Eekelaert tells Speed Motorsport News about Jordan's technical preparations for the European Grand Prix season. Taking a look the first three Grands Prix of the 1997 season how would you sum up the Jordan Peugeot team's efforts - from a technical and from a sporting point of view? "Technically we have made constant progress. You can measure that by looking at our performances in qualifying in Australia where we were 12th and 14th on the grid. We were seventh and 10th in Brazil and in Argentina, 6th and 9th. Apart from the fact that our young drivers have made progress, I think one has to underline the fact that this year Jordan produced the car very late so as to have extra time for the research and development and the fabrication process. The chassis engineers - and the engine builders - are getting to know the car which was not possible during the limited amount of pre-season testing. Consequently we are on an upward curve in terms of performance and development. Having said that, the various split times at the three circuits we have already visited show that the engine is right up there and has already reached the level of competition which was expected of it at least in the first half of the season." Are there any negative sides to the technical summary and areas where you need to improve things quickly? ''The late arrival of the car meant that we had to put a lot of faith in the reliability while focusing on better performance. During the pre-season testing and in the first races, we demonstrated that we had a strong car - in comparison to the competition. The Jordan Peugeot Is very competitive right through a Grand Prix. The 1997 car is a lot more aerodynamically advanced than last year's car. This improvement in aerodynamic downforce gives more grip. The car is much stiffer and better balanced. The rigidity between the car and the engine and the engine and the gearbox - which we worked together on - is much better. It provides greater stability and the aerodynamic performance is constant and depends less on the pitch-angle of the car. As far as the Peugeot A14 engine is concerned, it is more compact and has less internal friction losses. It is also more powerful but has not lost any of the torque, which combined makes it a step forward everything is going in the right direction. The car is a step forward from the 1996 version but does it have the potential for much more development? "That really is directly dependent on the resources available to the team Eddie Jordan understood the need to build up the operation and has invested a lot in both new equipment and more staff." Going back to your summary of the season so far, can you talk a littte about what it's like having two young drivers in a team. does it give the team a special atmosphere and what are the problems it creates? 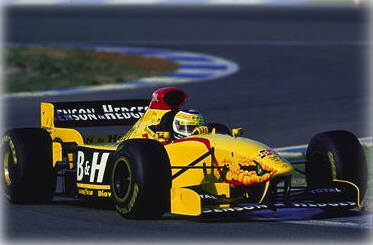 Ralf Schumacher - not paid to be friendly. People say that there is no great rapport between the two drivers and that energy is being wasted because it is being channeled in the wrong directions? "Our drivers are not paid to be friends. They are paid to drive quickly and get results. It is true that they do not exchange much technical information and leave it up to their engineers to do that. This is obviously not an advantage." What does Peugeot think about the behaviour of the drivers and the need to produce result rather than collide as they did in Argentina? "Eddie Jordan is their boss although we certainly talked with Eddie immediately after the race about the incident which eliminated Fisichella after a crash with Schumacher. After each race we have a chassis-engine debriefing and we discuss technical and tactical aspects of the race. When there is an Incident such as there was in Argentina which cost us points and a good finish we obviously have to speak to Jordan to define cases in which one needs team orders to ensure a good result for the Jordan-Peugeot team. After the flyaway races at the start of the season - which do not give you much chance to make technical changes -the European season is now upon us. What is the programme of developments for the next few races? "We are working on ways to adapt the engines to the different tracks we visit. The work of the engine-builder consists of precisely refining the engine mapping to fit a circuit that we already know - thanks to previous experience. On the chassis side after not doing much development during the first three races, we are embarking on the European tour with some pretty big changes ahead even if they do not seem spectacular. These include an improved aerodynamic package which according to the figures from the wind tunnel, ought to give us two or three tenths of a second a lap. That is one row further forward on the starting grid. In terms of mechanical bits, Jordan is developing an active differential which means that the driver can press a button on the steering wheel and the set-up of the differential will change to suit the next corner whether that is a hairpin or a 150mph sweeper. At the moment we are using a passive system which is a bit of a compromise. The aim is to have the new differential in time for Monaco and that ought to bring us some improvement. What about the engine development? What does Peugeot have up its sleeve up to the mid-season? "Jean-Pierre Boudy 's team has some development parts which are now running on the test beds. These produce more horsepower and improve the power curve but we will not be putting these onto the racing engines until they have been properly tested." What is Eddie Jordan doing to improve his team? "The Jordan team is no longer a small operation. It is now an average-sized team it has grown from 70 to 120 people. This includes an aerodynamics department which now has four people, compared to the old arrangement where Gary Anderson did the work himself. The number of days in the wind tunnel has gone from 50 to 120 in a year. The team has bought its own wind tunnel located at Brackley not far from the factory, and this will be operational in May. The team has also established a quality-control department to inspect the many parts which are supplied by sub-contractors. Jordan has bought itself a gearbox test bed so that transmissions can be checked before they are put into a car. The biggest step forward, however, is the purchase of a four-post rig which enables the team to simulate the pitch, roll and aerodynamic loadings of a car in relation to individual track surfaces. This is all reproduced using recorded data and can be used when we are away at a Grand Prix to help establish setup." As we go to Imola what can you tell us about your level of performance at the circuit? "The Imola circuit demands a lot from an engine, which ought to suit the Peugeot A14. There are big changes with the need for power in very different and difficult circumstances, in places which have very low revs. The smoothness of the response or our engine ought to be able to cope with that. You have to have a pretty good car - even if the tyres will be a bit of an unknown factor. But the Jordan engineers have sorted out the problems of last year's car which was very unstable under braking. Imola is always a demanding circuit in this respect."